December 14, 2017 at 12:05a.m. For Air Force Reserve Master Sgt. 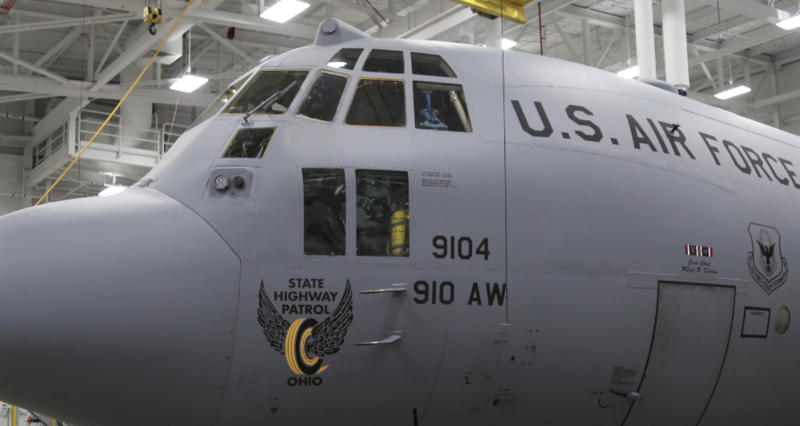 Rachele Fidram, the dedication of new nose art at Youngstown Air Reserve Station depicting the Ohio State Highway Patrol’s emblem, is an honor for her whole family. The aircraft maintenance technician’s father worked with OSHP 30 years before retiring, and her brother, Matthew Fidram, is a trooper. Wednesday, the air base unveiled the nose art for their C-130 Hercules aircraft, which Fidram works with everyday. The nose art depicts the patrol’s “Flying Wheel” symbol, one of the most recognizable emblems of the state’s law enforcement agencies. The aircraft was chosen because of Fidram’s personal ties to the patrol. She said the air base and the patrol collaborate to provide support for bad accidents, and the patrol helps with air shows. They also work together for traffic control and events such as presidential visits. Col. Daniel J. Sarachene, commander of the 910th Airlift Wing at the air base, said the base is grateful for its collaboration with local, federal and state law enforcement. “The Ohio State Highway Patrol is a great partner for us,” Sarachene said. Sarachene said nose art has always been a morale booster for aviators. Other famous nose art on military airplanes includes the Enola Gay, the Memphis Belle and, more recently, Valley boxer Kelly “The Ghost” Pavlik. May 4, 2018 12:03 a.m.
December 13, 2017 10:51 a.m.
February 6, 2010 12:07 a.m.
August 5, 2009 12:04 a.m.